36-48", a full three weeks of intensely hot orange flowers with non-fading blooms that make this Iris a must for your garden. Plants are highly drought tolerant. For best color show, plant in groups of three. Divide crowded plants in August. Zone 3-9. The "Kwanzan" cherry produces showy, deep pink blooms in spring and brilliantly colored orange, yellow or copper foliage in the fall. 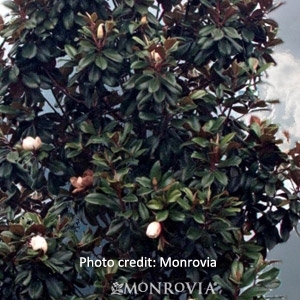 It is a small ornamental tree growing to a height and spread of 15 to 25 feet. Several sizes available. 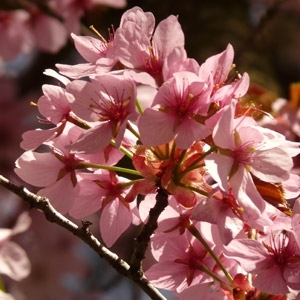 Yoshino Cherry Tree is a deciduous, flowering tree with almond scented bloomsin clusters of white or pink. 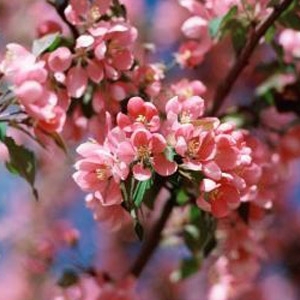 Bloom time usually lasts for about two weeks, and then the leaves will appear. 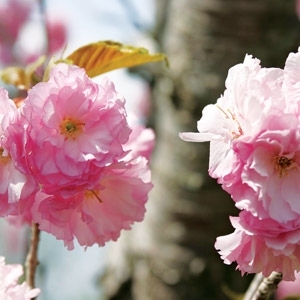 The Yoshino cherry tree has been bred for its ornamental quality, as opposed to its fruit. Several sizes available. 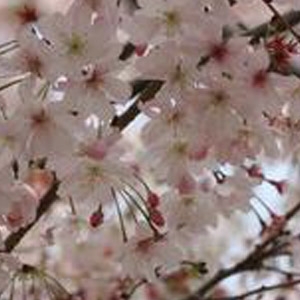 Okame Flowering Cherry Tree is one of the earliest blooming trees in Athens! 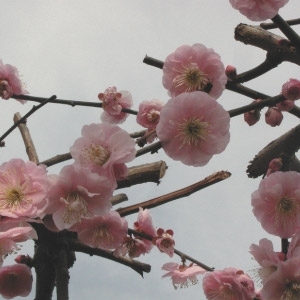 The tree covers itself with single pink flowers in early spring that have red calyces and stems, making an unusually striking color contrast before leaf break. 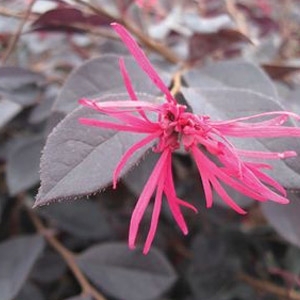 Garnet Fire™ Loropetalum produces red tassel-like flowers against burgundy leaves in early spring. The leaves hold the burgundy color well. It matures at 4 to 5 feet tall and wide. 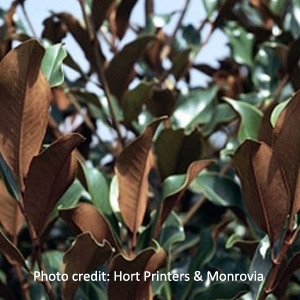 Lustrous, leathery foliage is rich, dark green above and cinnamon brown underneath. Large, 5 to 6 inch creamy white flowers are exotically fragrant. Transplants well and does not lose as many leaves as other varieties. 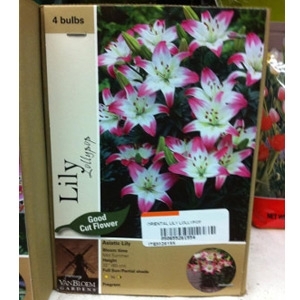 Has good cold hardiness. Evergreen. Several sizes available. A very compact, upright grower whose shiny, deep green leaves have a heavy reddish-brown felt beneath. Large 6 to 8 inch fragrant white flowers dot the plant throughout the warm months. A superb small specimen or accent in the landscape. Evergreen. Several sizes available. 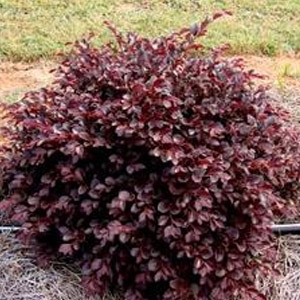 Crimson Fire features rich ruby-red persistant foliage throughout the year, on a very compact and neat plant that is perfect for small space gardens and in foundation plantings. 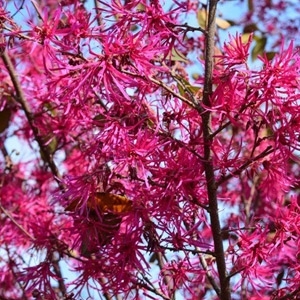 The vibrant neon pink flowers in spring are a bonus and are highlighted by the ruby-red foliage. ‘Burgundy Blast’ bears fragrant, many-petaled, spidery hot pink flowers in late winter and early spring and sporadically at other seasons. 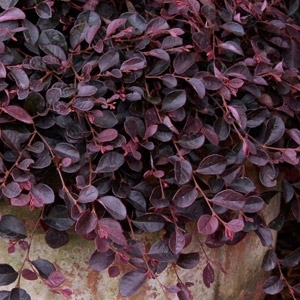 It produces new burgundy to purple foliage; the older foliage is dark burgundy to dark green. In zones where semi-evergreen, the foliage may exhibit orange foliage in the fall. 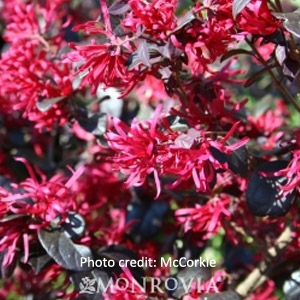 Vivid deep red flowers combine with extremely dark burgundy foliage to create a stunning, compact shrub. An exceptional foundation plant or accent specimen. Use to create high contrast effects in beds and borders. Evergreen. Silvery white margined green leaves cover the densely held branches and become scarlet magenta in fall. New spring growth is pink tinged. 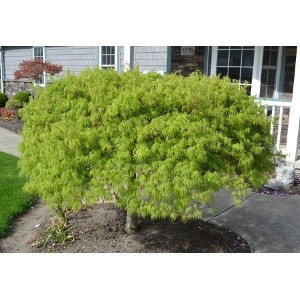 A slow-growing shrub-like tree for containers, bonsai, and Asian or small gardens. Deciduous. Best grown in moist, fertile, well-drained loams in full sun to part shade. Best flowering occurs in full sun. Higan cherry has better tolerance for summer heat and winter cold than most flowering cherries. 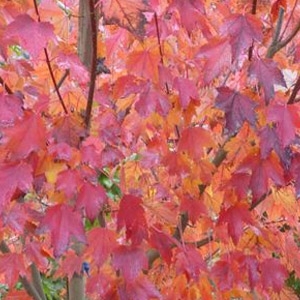 An improved hybrid with brilliant, long lasting orange-red fall color, a uniform branching habit and rapid growth rate. Thrives in much warmer climates extending well into the deep south and west. An excellent lawn, park or street tree. Deciduous. 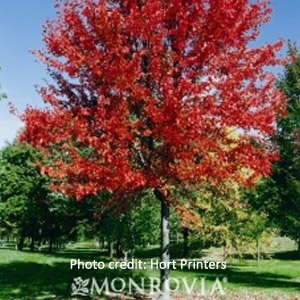 This seedless hybrid between Red Sunset(R) and Autumn Flame Maples features reliable bright red fall color and a very uniform shape with a dense oval head and dark green summer foliage. A U.S. National Arboretum introduction, maturing at 40 feet in height with a 35 foot spread. A more heat and drought tolerant form of this species, with superior insect and disease resistance. Densely pyramidal form with glossy green leaves that fade to clear butter yellow in fall. 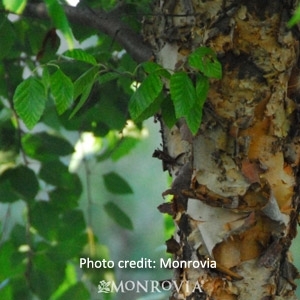 Winter bark is pinkish-orange with prominent exfoliation. Large tree as focal point or for shading. Deciduous. 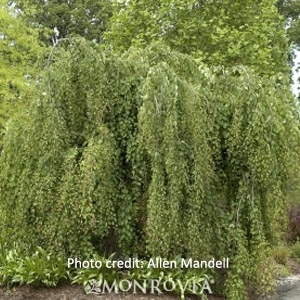 An eye-catching specimen; its weeping branches form an attractive dense crown. Beautiful blue-green foliage turns bright yellow in fall. 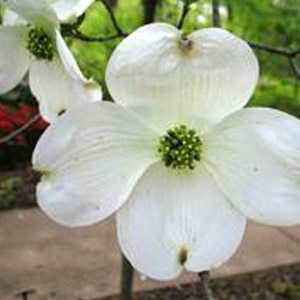 Grafted at 5 ft. to display pendulous branches. Deciduous. 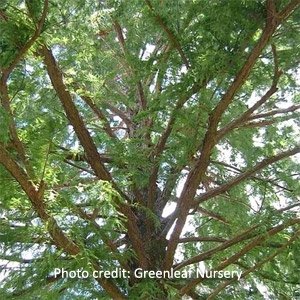 This tree sports unusual, green, fern-like foliage that resembles needles and turns a coppery bronze in fall. It grows moderately to rapidly 50 to 70 feet tall and 20 to 30 feet wide. The tree is adaptable to a wide range of soils and moisture conditions, and displays very good wind resistance. Vivid green finely cut leaves change to beautiful shades of gold and crimson in the fall. Small tree with graceful weeping habit and excellent branching architecture. 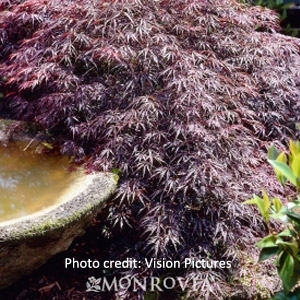 Mound-shaped, dwarf tree with waxy, deep red bark and graceful cascading branches. 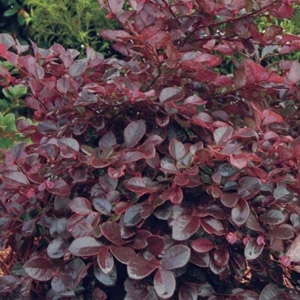 Deeply cut and dissected purple-red foliage throughout the summer changes to bright red in fall. Double pink flowers cascade down weeping branches in early spring. Effective as large bonsai or container plant. Can be the focus ofattention in a winter garden. Grows to a height of 20-25 feet and spread of 15-20 feet. Cold Hardy to U.S.D.A. Zone 6. 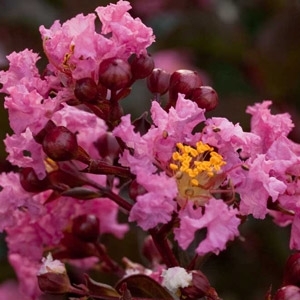 Southern Living® Plant Collection expands Delta Series Crape Myrtle lineup: Jewel-hued beauties Delta Breeze™, Delta Eclipse™, Delta Flame™, and Delta Moonlight™ are versatile landscape accents. 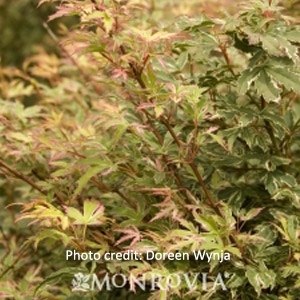 Characterized by their unique burgundy, cupped leaves, the new Delta series Crapemyrtles bloom profusely in four colors: white (Delta Moonlight™), red (Delta Flame™) and lavender (Delta Eclipse™) and light pink (Delta Breeze™). These small trees are a welcome accent for gardens that need height and color. Growing between 6-10 foot tall, these moderate- to fast-growers are deer-resistant and thrive in full sun to partial shade.